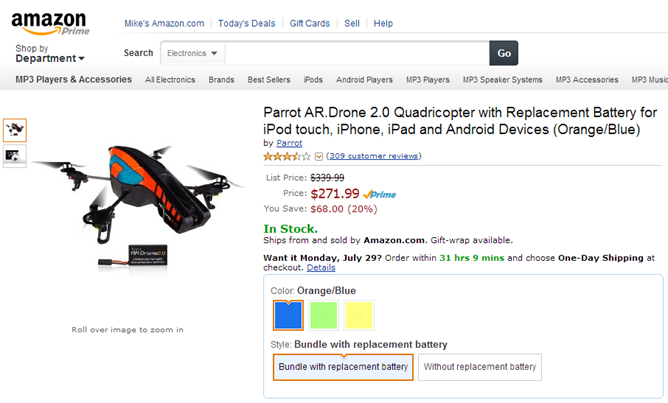 If you've been waiting for a good deal on the ridiculously fun (but admittedly expensive) Parrot AR Drone, now's the time to get one. 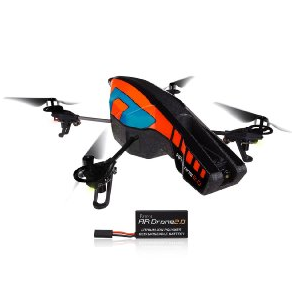 Amazon has the 2.0 version of the smartphone-controlled, camera-equipped quadcopter, plus a spare first-party battery, for just $271.99. That's 20% off, a savings of $68 on the combined retail prices. As with all Amazon Gold Box discounts, it's good for one day only, July 26th. The Parrot AR Drone has made a big splash in the world of tech and computer toys, thanks to its impressively stable flight and solid smartphone app, which allows Android and iOS devices to remotely control the drone, plus view and record 720p video through its onboard 720p camera. It works via WiFi at a range of up to 300 feet, with simplified controls for those who aren't used to RC flying machines. (Note that there is no included controller - you HAVE to use an Android or iOS device.) The app has recently been updated to work with NVIDIA's SHIELD controller, a nice touch if you're planning on picking one of those up as well. The standard package includes two styrofoam shells: one with the four rotors exposed for outdoor flying, and one with foam coverings around them for indoors. Three trim colors for the indoor shell are offered, blue, green, and yellow. Once again, Amazon Gold Box deals are good for one day only, and stock tends to go quickly. If you're ready to buy, do it sooner rather than later. Two-day shipping is free for Amazon Prime subscribers.